Blogging Quick Launch Guide shows how to Get Started in 60 Minutes—And Spend Less than an Hour a Month. In my 2010 Predictions for Web 2.0 and Social Networking, I predicted that, within 3 years, executives would be expected to have their thoughts online, chiefly by blogging. If you do not blog, you will lose opportunities to those who do. Web 2.0’s increasing transparency is raising the bar for the amount of yourself you share online. If you’re not available when people need you, they will call someone who is. It’s that simple. That’s easy for me to say because I have blogged for years, and I know it can be an overwhelming proposition. For every 100 people I mention this to, 90 say that they intend to start, but they never do because it’s not that easy. This Quick Launch Guide will take the mystery out of it and have you online in less than an hour. You’ll also develop a basic content strategy and a realistic publishing schedule. Ready? Let’s go! Quick, if you were hiring an executive or consultant to revamp product development and juice profitability, whom would you interview first? Joe has an impressive resume, 15 years experience, MBA from a good school, worked for a key competitor two jobs ago and has some impressive bullet points for results. He has also entered his resume information on his LinkedIn profile. Cynthia also looks good on paper, 10 years relevant experience, solid education and results. But she’s also blogged several articles on techniques for overhauling product development, including a case study on how a competitor got some good results. My point is that, when it comes to hiring, you need to apply your expertise to the exact situation you’re looking for by blogging about it. This shrinks the decision cycle in your favor (unless you’re Joe ,^). Cynthia’s key expertise is product development, but she’s moved to the next step by applying her expertise to a scenario (increase profit by revamping product development). She’s written about other companies who are doing it. She’s much easier to buy. I’m assuming that, although you may have tried blogging in the past, you aren’t doing it now and you want to get started this afternoon. There are myriad options, so I’ll suggest a simple one to get started. You can change your mind about anything later. All are free. WordPress is one of the gorillas, and there’s a reason. It is a huge community, which means that the technology gets updated and extended often. This is important to you because plugins increase the functionality of your blog. There is also significant online help; whatever problem you may encounter, someone else has resolved already. 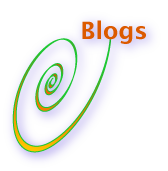 All my blogs are now on WordPress. Blogger is another online offer, by Google. I’ve never used it but have heard good things about it for simple blogs. I can also recommend Tumblr, although it’s a bit more geeky and limited in functionality. I’ve also used more esoteric platforms like Serendipity that have awesme features but require more handholding. Pick a username, password and simple theme. “Themes” are templates that determine the color scheme and layout of your blog. It is very easy to select new themes, so don’t get hung up on how your blog looks right now. Choose a simple one to start. Similarly, pick a working name for your blog that is short and somewhat descriptive of your area of expertise. An acceptable default is “Christopher S. Rollyson’s Blog.” Obviously, you can change this later. Think of the first month or two as operating in stealth mode; you’re going to post and get the feel of the machinery, the content and the schedule; then you’ll revisit name, appearance and publicity. I’ll discuss that in a future post. It is usually a good policy to standardize usernames across Web 2.0 platforms, so try to pick something with ten characters or less that’s fairly easy to remember. Since I have an unusual last name, I have standardized on “csrollyson” everywhere. Make the password fairly difficult yet easy to remember for you. Hackers increasingly target bloggers. Your blog provider gives you a dashboard to manage your blog. We’ll be working with this for a few minutes. When you sign on, pick the name and theme and hit “submit,” you will probably end up on the first page of your blog. Look for a link that says something like “admin” or “log in” in one of the sidebars. Enter your username and password, and you’ll access the dashboard. If this doesn’t work right away, you might have to check your email and confirm it before the system will accept your credentials. The dashboard is where you create posts (blog entries, articles), edit posts, edit comments and install plugins and widgets. You can also change your blog’s name, install another theme, change password, etc. If you use WordPress, make sure to hit “Appearance” in the left toolbar and, beneath it, “Plugins.” WordPress’s antispam solution is called “Akismet.” You’ll need to activate it as a plugin. This may seem confusing, but bear with me. It will automatically appear in your plugin list, but you’ll have to turn it on. Click the activation box, and WordPress will force you to get an API Key to paste in. To get the API key, control-click when you hit the link “get API key,” and open another browser window because you will have to create another username and password on another WordPress site. (use the same email you used to sign up for your blog). Get the API key, and paste it into the Akismet box. This will filter out a lot of spam. In the dashboard, you can create a few categories. Now you’re on a platform, so to succeed you need to match two things: 1) The readership: who are the people you would love to read your blog? Whom do you want to attract? What kinds of things do they think about? 2) You: what are you passionate about? What kinds of thorny problems do you like to solve? Use Value Vectors to develop a beginning content strategy that matches the readers with your expertise and interests. Start with three value vectors. Now think about your business goals and readers’ interests in order to create “categories” for your blog. Whether you work for a company or you’re a consultant, your interests, expertise and audience will transcend your work situation in most cases, so make your categories aligned with readers and broad (start with 5-10). One useful metaphor is sections of a newspaper. Categories are important because people can subscribe to them via RSS. You want to let people only read one category of your blog if they want. Also, when anyone clicks on them, they will only see posts in that category. You can easily change names and numbers of categories later. And they change retroactively. Here’s a personal example. I know many executives in transition. As I suggest in Blogging and Tweeting to Support Your Job Search, create a category in which you write about the insights you get from your research and meetings. Call it “jobsearch.” Here you report on what you are learning while on your search. This is very useful for people who help you: in one click, they can get an update, and they can give other people the link to your job search category. Also good for friends who might not be interested in your thought leadership, but they want to help you in your search. Here’s a professional example: Cynthia might have “Product Development,” “Gaming,” “Software” and “Telecom” for categories. Four of our categories at the Executive’s Guide to Twitter are Blogging, Case study, Guides and Executive Seminars. Garnish categories with Tags. Think of tags as being more specific qualifiers to your posts. If you aniticipate writing about an industry, have a few industry tags. Or technologies. Tags are also published as RSS feeds. You can have many tags on a post, but most posts are filed under one or two categories. Look at how I tagged this post. If you really want to get the idea, check out the Global Human Capital Journal, which is four years old. Most executives I know relish writing about as much as going to the doctor. Therefore, here is a way to get your sea legs with minimal pain and maximum efficiency. We are all swimming in “content”—online news articles, tweets, university articles, blog posts, trade journals, videos, conference programs, white papers… Let’s say you read 100 a week and, if you’re a good screener, over half will be fairly relevant to you, and ten will be really great. Most printed articles are also online, so create a special bookmark folder for articles you’re going to blog about. Bookmark the really great ones there. Set yourself a goal of an article a month or a week. In the post, you give the title of the article, and a link to it. You also share your thoughts about it, why you thought it was important or relevant. Aim for a paragraph or two at most. If you do one of these a week, you’ll have four posts at the end of the month. Make sure they fit your content strategy. I have an example below. You are reading the articles anyway, and this approach will take you 20 minutes or less when you’re used to it. You will also understand the article you’re writing about at a deeper level. This is all it takes to start a blog! Facebook Turns on Another Revenue Stream—Now You Can Pay with Facebook suggests the possibility of a major transformation in the role of social networks in their members’ lives. All the major platforms struggle with the problem: they have millions of people on their sites, but members hate ads, so the platforms struggle with monetizing the attention they have. Facebook members share things with each other all the time, including suggestions for all kinds of products. When Facebook launches its own payment system, friends’ suggestions could turn into purchases, which would make Facebook even stickier and drive up advertising revenue as well as allow Facebook to establish its own “discount rate” (as Visa and American Express do). This is really something to watch because Facebook could morph into a social e-commerce platform of sorts, one with 400 million members. Think about Amazon, but get reviews from your friends. Many possibilities. I hope that this quick launch guide is clear enough to get you going. The beauty of blogging platforms is, it’s very easy to make changes, even retroactively. Rename your categories and tags and posts. Change your theme and appearance. The goal here is to give you enough information to get going at a basic level and operate in stealth mode for a while to get more comfortable before expanding. I’ll post another guide that you can use when you have 10-20 posts up. At that point, you can start refining your approach: revisit your blog’s name and appearance; begin using its marketing tools; using illustrations; installing other plug-ins and widgets, etc. Help me to help others! In comments, below, please share what was useful, what was confusing, what was missing, etc., so I can make additions and corrections. Note that this is filed under the “Guides” category, which is all about how-to. Enjoy! Left your 6/8/11 Northwestern webinar pumped up to try on blogging. It took me over 6 hours to create the WordPress blog, a content strategy including Value Vectors, Categories and Tags, and my first blog post. Your guidelines have helped me come up with a ton of blog post ideas. Only thing I couldn’t figure out was how to actually enter the API code on my blog based on your instructions or the ones on the WordPress site. It seems like WordPress did it automatically for me when I clicked on a link to request an API code, but I’m not 100% sure yet. Sandra, thanks for the update, and glad the session was useful! When you write “API code,” do you refer to the Akismet API key? It’s required to set up Akismet and some other WordPress plugins. If so, I don’t think you are set yet unless they’ve very recently streamlined it. WP can be a bit confusing at times because there’s wordpress.org and wordpress.com; .org is a community for extending WP. The API key is like a long password that WP assigns you when you request it. You use the same one for everything, and of course it’s tied to your wordpress credentials. You copy and paste it into plugins like akismet that request it. Try this: in your blog, go to the Dashboard (admin console) and in the left sider click “Plugins”; it’ll expand, then click “Plugins” (again). The plugins screen has 3 views, All, Active and Inactive. Find Akismet. It’ll probably be Inactive. If so, activate it and paste in your key. Keep it in your password manager or other safe place; you won’t need it too often, but occasionally. Hope this helps! Please write back and share your URL!